World leaders and Holocaust survivors gathered at Auschwitz on Thursday to commemorate the liberation of the Nazis' most infamous death camp. Here is a selection of quotes from people at that ceremony, and from elsewhere in the world. "Let us remember that we are on the site of the most gigantic cemetery in the world, a cemetery where there are no graves, no stones, but where the ashes of more than one million people lie." "I want to say to all people around the world - this should not happen again. I saw the faces of the people we liberated - they went through hell." "This is the biggest cemetery for Jews, Poles, Roma and Sinti. It must tell us that we have to come back here again and again. We must keep the memory of the worst crime in human history alive for those who were born later." "The snow was falling like today. We were dressed in stripes and some of us had bare feet. These were horrible times." "It's here, where absolute evil was perpetrated, that the will must resurface for a fraternal world, a world based on respect of man and his dignity." "We're in a place where no words can tell the truth about what happened... But they have to. This was hell on earth." "The Holocaust is not only a tragedy of the Jewish people, it is a failure of humanity as a whole." "My father was a wounded soldier and he was in Auschwitz. He had a tattoo 11367 on his chest. I came here with my children and I hope I will come here with my grandchildren. This is a sacred place for me and my family. "There will never again be a Jewish question in my country. The tragedy of the past will never be repeated on the soil of Ukraine." "The story of the camp reminds us that evil is real. It must be called by its name and must be confronted. "Gathered in this place we are reminded that this immense cruelty did not happen in an uncivilised, faraway part of the world, but at the heart of the civilised world." "The people were liberated, mankind was not." "That attempt at the systematic destruction of an entire people falls like a shadow on the history of Europe and the whole world, it is a crime which will forever darken the history of humanity. "May it serve, today and for the future, as a warning: there must be no yielding to ideologies which justify contempt for human dignity on the basis of race, colour, language or religion." "We remember above all that the Holocaust did not start with a concentration camp. It started with a brick through the shop window of a Jewish business, the desecration of a synagogue, the shout of racist abuse on the street." 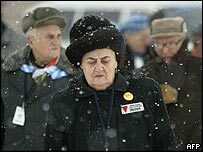 "The lessons of the Holocaust are simple to understand, however hard they are to live. Never blame others for your troubles. A society is as large as the space it makes for the stranger. Cherish life. Fight for the rights of others." "I have mixed feelings. Some can forgive, and some cannot. I can forgive, but with a cold heart."